As I inched through the narrow corridors housing Frida’s iconic works and artefacts, I could feel the emotion jumping off the walls. Charting her life from early childhood until her very sad early demise, the show is an intimate portrayal of the struggles and the strength of this powerful heroine. Never camera shy and clearly her father’s favourite, she learned to pose very early, being centre stage in many of her father’s works. This started her lifetime fascination with self portraits and her art become her ultimate escape from years of pain. A rebel challenging stereotypes she donned male clothing in family photographs as a youngster but after marriage wore traditional Mexican dress adapted to fit her own needs. Embroidered dresses, bright pink boots, cat’s eye sunglasses – ahem can you get any cooler! Even when lying in bed for weeks on end she was never without flowers in her hair, bold, beautiful jewels and immaculately made up, a woman who dressed to please no-one but herself. 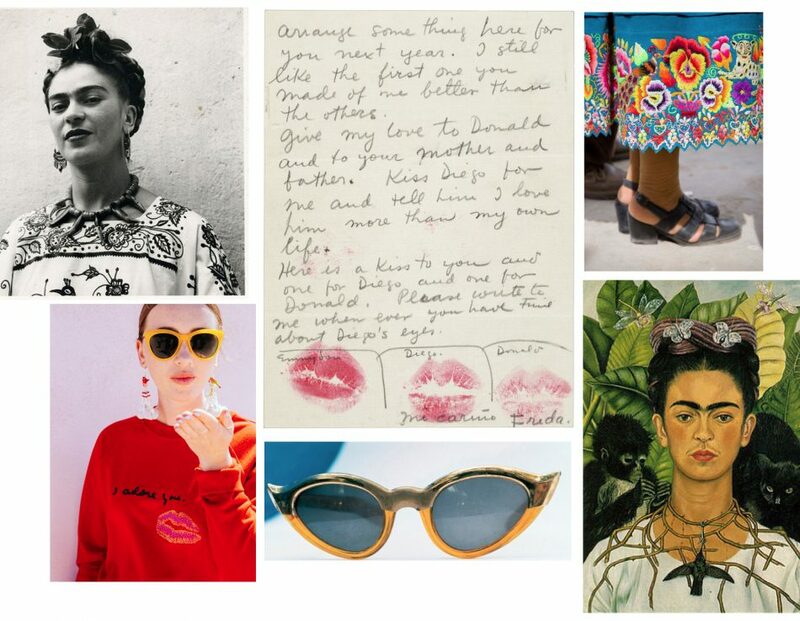 Frida embodied Girl Power. She defied her mother who wanted her to follow traditional norms, get married and have children and instead pursued her dreams of becoming a doctor. She was one of the first women admitted to the Escuela Nacional Preparatoria where she joined a socialist group and took her first activist steps which she continued until her last protest against the American intervention in Guatemala the week before her death. Polio at age 6, a near fatal bus accident at age 18 leaving her unable to bear children, 40 operations, months spent in full body casts, doctors weren’t sure she’d live. She did, for another 30 years, but in a great deal of physical and emotional pain. Despite all of this she continued to live, love, paint and never gave up, becoming one of the worlds most celebrated female artists.